On Thursday, September 7, 2017, the O/OFA tour group traveling to Northumberland, England, met with representatives of Kirkley Hall campus to dedicate Ogle Pond on the beautiful grounds of Northumberland College. 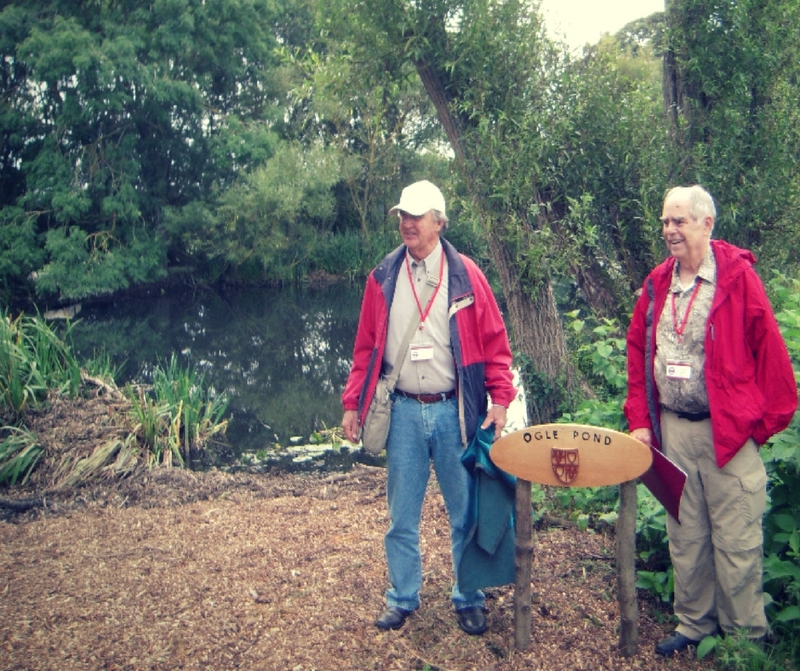 Ken Ogle, President, and Charles Owens, Vice President, of the Ogle/Ogles Family Association unveiled a handmade wooden “Ogle Pond” sign that honors the Ogle family. Thanks to the generous contributions by O/OFA members, $2,500 provided the means to clean up and help provide ongoing restoration of a spring fed pond. Many hours of hard work by students and volunteers have gone into cleaning up the water and overgrowth from the lovely pond. A boardwalk has been constructed and wildflowers and trees have been planted. The pond is part of the estate of Kirkley Hall, originally owned by Ogle ancestors from 1612 – 1928. It was used to supply fish for the residents of the manor house in the early days. In keeping with England’s conservation standards, the 190-acre woodland and stunning rural campus uphold these standards. Northumberland College offers vocational courses and apprenticeship training in agriculture, horticulture, floristry, animal and equine care, environment, and provides outdoor activities and leadership training. Besides the Grade II Listed Kirkley Hall, the property also has a beautiful Victorian walled garden and green houses. With our gift to the pond restoration, we continue the legacy of the Ogle presence at Northumberland College. We are proud of our past legacy to Kirkley Hall and the land. We acknowledge continued Ogle presence by providing help to bring Ogle Pond back to life. And we carry the Ogle legacy forward into the future through the education of the students of Northumberland College. This entry was posted in Newsletter and tagged Ogle Pond. Bookmark the permalink.